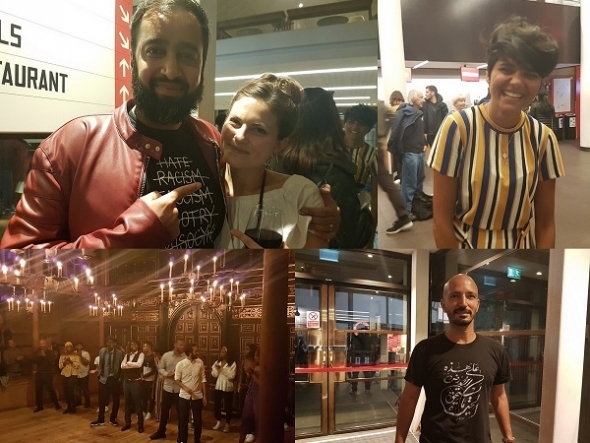 ‘Voices in the Dark’, was a very special event that took place at The Globe, and began The Shakespeare & Race Festival (August 11-18) that highlights the importance of race in the time of the Bard and today. Michelle Terry, artistic director of The Globe, explained in the programme notes that the main cause is to “celebrate Shakespeare’s impact on the world”, and to this effect they collaborated with two young people’s organisations, Voices and Intermission Youth Theatre. Voices, is headed by siblings Oly and Daisy Boulton to bring to life the marginalised or unheard voices from London and ‘Young Muslim Voices’ is their first project. Mentored by actor, Asif Khan (pictured above with Daisy), it features monologues and performance poetry by Muslim writers who performed their work in the candle lit Sam Wanamaker Theatre. Intricately woven into this, were extracts from Shakespeare’s works which highlighted difference, beginning with a ‘The Stranger’s Case’, a speech from ‘The Book of Sir Thomas More’ (see the link below), where he is speaking to a mob who want ‘strangers’ to be banished. Another extract is from ‘The Tempest’ (Act 3, Scene 2) where Caliban talks about, “The isle is full of noises, sounds, and sweet airs that give delight and hurt not”. And there was also an extract by young members of the Intermission Youth Theatre – that helps Londoners from socio-economically disadvantaged backgrounds – who performed The Wedding Scene from ‘Much Ado About Nothing’, where Claudio rejects Hero and accuses her of being unfaithful. The performed monologues dealt with how Muslims have been demonised as the ‘Other’ and there was a plea for compassion and understanding in a really human way. Waleed Elgadi, actor and writer told the story of his T-shirt – which has ‘We Are Here on this Earth’(in Arabic) by Palestinian poet, Mahmoud Darvish – and why he wears it with pride, as the poem represents hope, pride and peaceful resistance. Elgadi, 40, who is of Sudanese origin, trained at Mountview Academy of Theatre Arts, and has worked at the Royal Shakespeare Company. He described how his acting career began in a post 9/11 world and so was mostly asked to play ‘terrorists’, being a gay man and believing in God. Another piece was about a woman explaining that when her azaan (prayer) app goes off on the train, people get uncomfortable and start moving away from her, so when her son asks her why? “I wanted to tell him that the beautiful Allah app moved them but I told him the truth, they were scared”. This theme is echoed in another piece about a young Muslim man travelling on the train with a rucksack on his back, which has his gym kit. There were two other disturbing pieces – one by Anonymous writer about being sexually harassed by a male cousin; and another by Sabiha Mank, from Birmingham, was on the injustice experienced by many Muslim women, “on the front line fighting wars every day that this world is unaware of,” such as photographer, Khadija Saye, who lost her life in the Grenfell fire. The evening ended on an exuberant note and with much dynamism. Sanah Ahsan’s poem, “My history has shaped a love for every form of humanity,” was tremendous. It was incredibly inspiring to see the range of stories being told. ‘Voices in the Dark’ was directed by Lekan Lawal, who is an artistic director at Up Next (Battersea Arts Centre), and the other writers were Abdul-Aleem, Deqa Abdi, Ali Zaidi and performance poet, Kwame Read. Shakespeare and Race Festival continue until August 18 at Shakespeare’s Globe, 21 New Globe Walk, Bankside, London SE1 9DT.